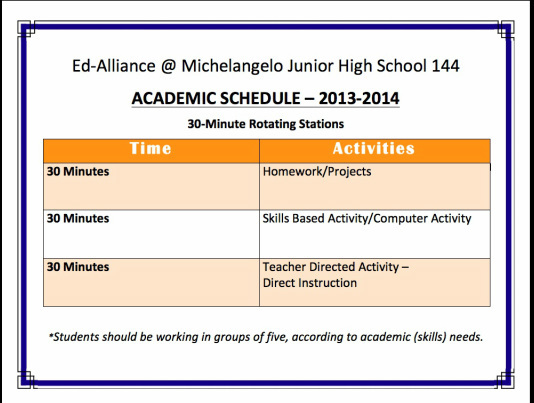 JHS144 has partnered with Educational Alliance to create an after school academic intervention service that promotes academic success for all learners. To achieve this goal, we have designed a small-group instructional protocol which allows teachers to target and remediate students' individual needs. The students are working in small groups of no more than 5 students per group following a 30-minute rotating stations routine. They will be given 30 minutes to work on homework assignments, 30 minutes to work on an online intervention program, and 30 minutes of tutoring with their teacher (as depicted on the right). In an effort to maintain an intensive academic support service that targets our students individual needs, each child has an after school portfolio for ELA and Math. In each of their portfolios is a "Data Tracker" (as depicted on the left). 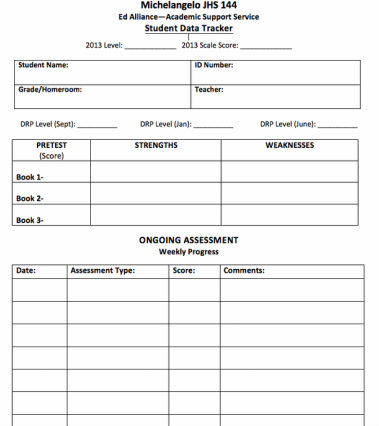 The Data Trackers identify the student's strengths and weaknesses based off of a Diagnostic pre-assessment. This information helps the students understand their needs and helps the teachers to cater their instruction towards each student's weaknesses. Tutoring time is not wasted on topics the students are well-developed in; instead the focus is on working towards mastery of their weaker skills. 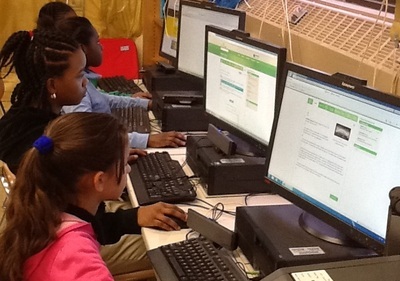 The teacher's then continue to assess each student's needs by providing quick progress checks (or ongoing assessments). 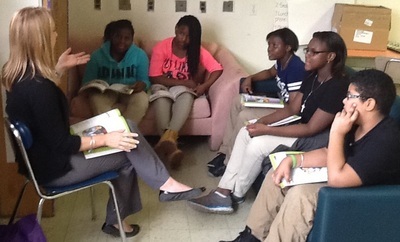 Through Ed Alliance, we are offering academic support in Math and ELA in preparation for the state exams. 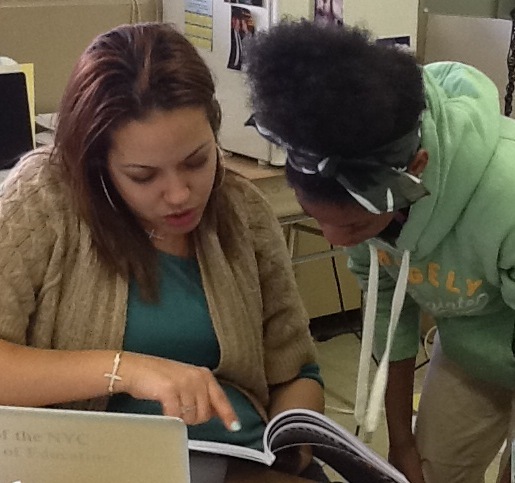 To provide enrichment to our top students, we also offer courses to practice for the specialized high school exam. The SHSAT is generally given in late October for eighth grade students-- actual test dates are not released until late in the previous school year. 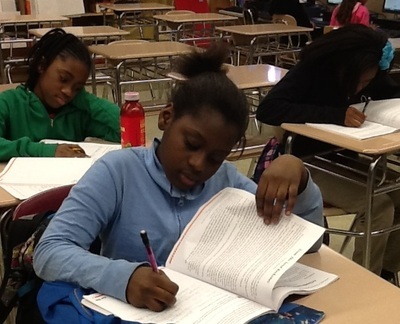 At JHS 144, we believe that beginning preparation for the exam in seventh grade, will allow our students to have a better chance of meeting success on the exam. There are only eight New York City Specialized High Schools of which entrance is extremely competitive. 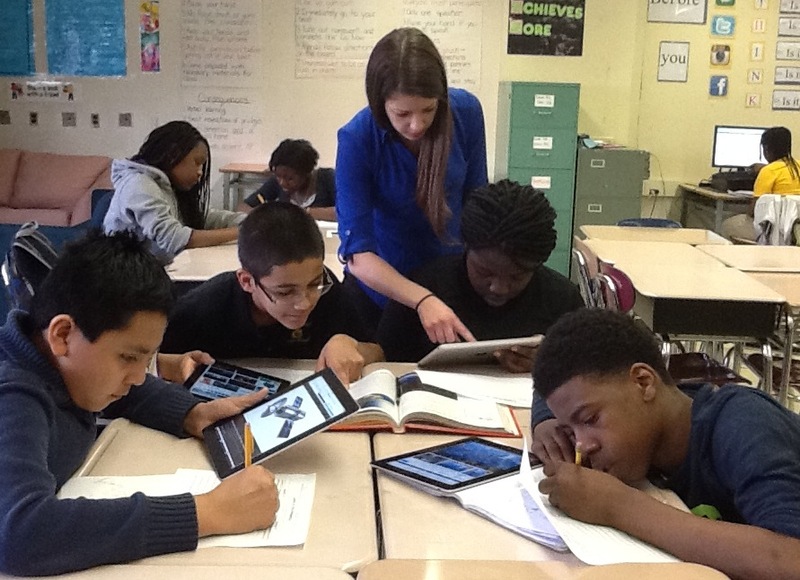 These schools were created in order to better meet the needs of our gifted students. Each of these schools has an outstanding reputation and offer students a competitive advantage when applying for college. Specialized high schools allow students to focus on the fields that interest them. The Specialized High School Preparation program follows a slightly different schedule than the rest of the school's academic programs. The SHSP students are split into two groups, of which they receive intensive instruction on 8th and 9th grade ELA and Math. SHSP runs on Tuesdays and Wednesdays from 2:30- 4:30pm. 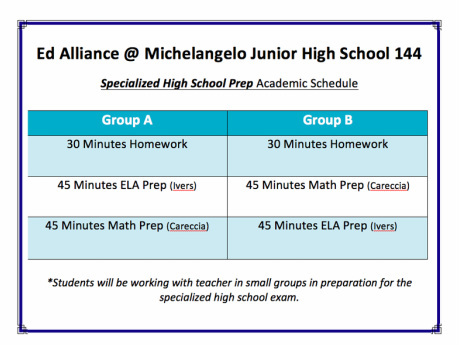 During that time, the students are given 30 minutes to work on their homework, 45 minutes of ELA or Math prep, and switch for 45 minutes of Math or ELA prep (as depicted on the right).